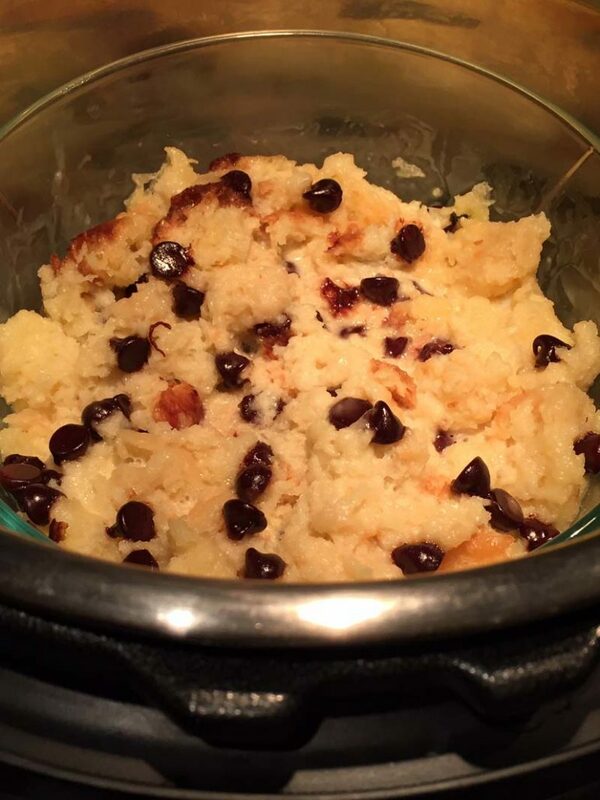 This Instant Pot bread pudding is amazing! So creamy and sweet with gooey chocolate chips throughout, this homemade bread pudding is better than any restaurant! Look at this mouthwatering bread pudding! So rich and tender, every bite is a comfort for your mouth. Bite into this creamy deliciousness and taste the melted chocolate chips for complete gooey ecstasy. Feel the richness, sweetness and simplicity – that’s the kind of dessert you need to lift you up on a cold winter day. This bread pudding is made in the Instant Pot (if you don’t own one, read my article “What In An Instant Pot” to learn more about this amazing kitchen tool). 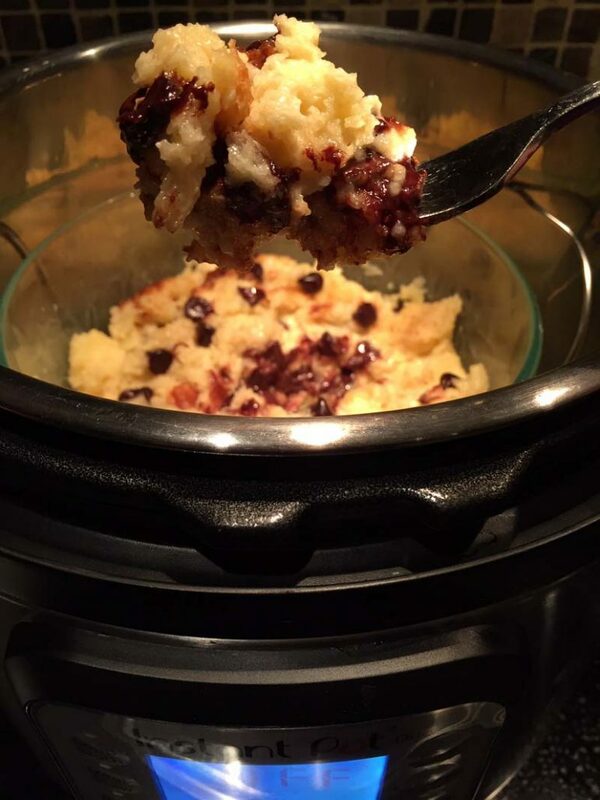 Instant Pot does all the work – throw in the ingredients and it will cook your bread pudding to complete warm ready-to-eat perfection in 10 minutes! Then you can grab your big spoon and dig in! An awesome thing about bread pudding is that it uses up leftover stale bread. I love rescuing ingredients that would’ve been tossed and turning them into something delicious! For another example of that, check out my Instant Pot banana bread recipe that rescues a brown banana 🙂 And I even have a category on my site called “Cooking With Food Scraps“. My favorite bread to use for bread pudding is challah bread (sometimes I even make it from scratch, it’s amazing – check out my challah recipe). Any type of bakery bread will work – if the bread tasted great fresh, it will make a great bread pudding when it’s a day or two old. For my collection of easy homemade breads, check out my bread recipes section. To make bread pudding in the Instant Pot, you need a heatproof container that will fit inside the Instant Pot. For this recipe, I use a 7 cup Round Pyrex Dish – it fits inside the Instant Pot perfectly. 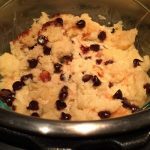 This Instant Pot bread pudding recipe uses very simple ingredients – bread, egg, heavy cream, sugar, vanilla and chocolate chips (for the exact quantities, see the printable recipe card on the bottom of this article). 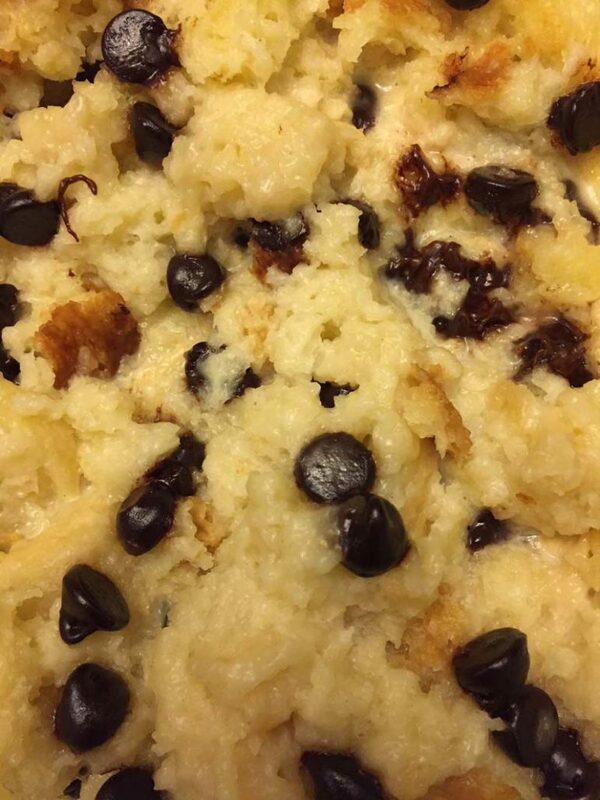 All you need to do to make this bread pudding is combine the egg, sugar, vanilla and heavy cream in a bowl, add the cubed bread and toss until moistened, then fold in the chocolate chips. Transfer the bread pudding mixture into the container that fits inside Instant Pot. Add 1 cup of water to the Instant Pot and insert the trivet (the rack that comes with the Instant Pot) with the handles up. Place the bread pudding dish on the trivet. Press the “Pressure Cook” or “Manual” button and set the time to 10 minutes on High pressure. When it’s done cooking, quick release (QR) the steam. Carefully lift the dish with bread pudding out of Instant Pot by grabbing the handles of the trivet with heatproof mittens. 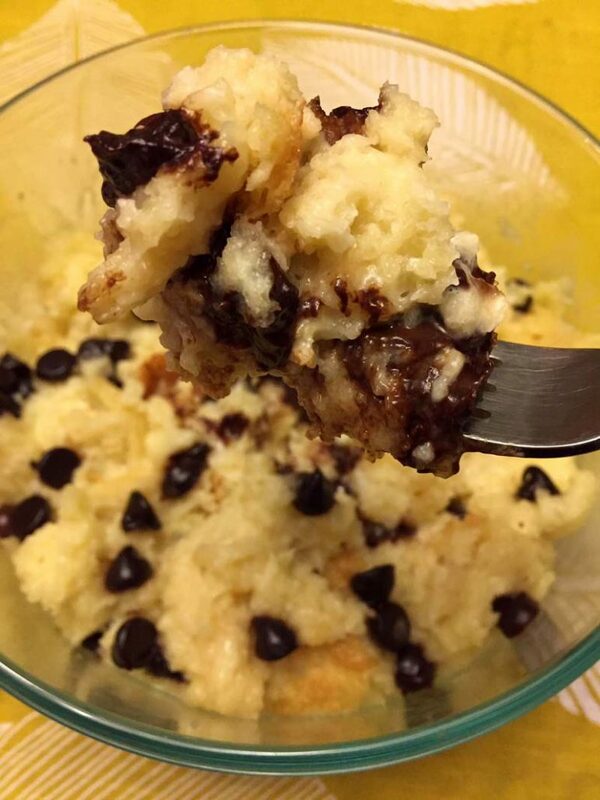 Enjoy your homemade chocolate chip bread pudding while it’s hot – yum! You can make this bread pudding ahead and store it in a refrigerator before ready to eat. A great thing about the Instant Pot Pyrex bowl that I’m using is that it has a lid and it’s microwave-safe. So you can store this bread pudding in the same dish you cooked it in, and warm it in a microwave when you are ready to eat it. 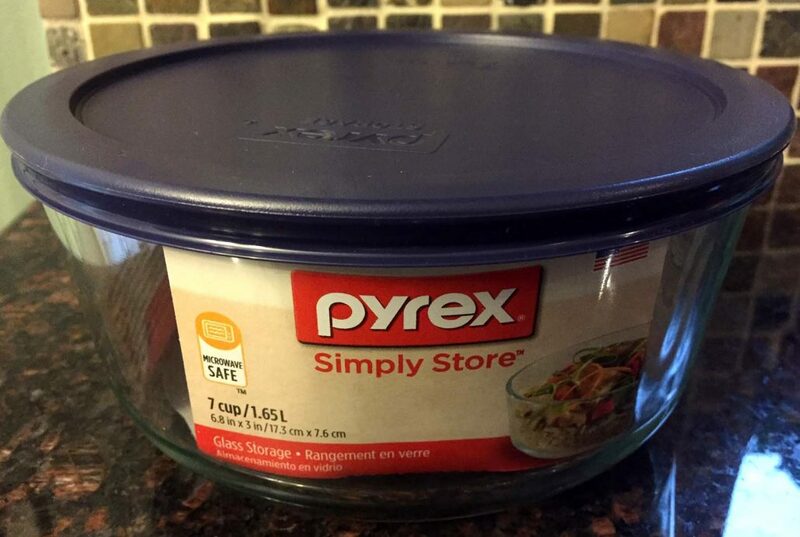 Click here for more info on Instant Pot Pyrex bowl. 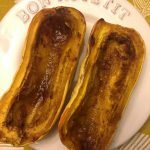 Instant Pot Banana Bread – got a brown banana? Make this delicious moist banana bread right in your Instant Pot! Instant Pot Pumpkin Pie – this is the only pumpkin pie recipe you’ll ever need! Making it in the Instant Pot is so much easier than in the oven! Instant Pot Cornbread – so golden-yellow, fluffy and delicious! This cornbread is always a holiday hit! 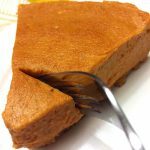 Instant Pot Pumpkin Cheesecake – once you try making a cheesecake in the Instant Pot, you’ll never make it any other way! Instant Pot Baked Apples – stuffed with cinnamon and raisins, these easy baked apples just melt in your mouth! Want to make bread from scratch (and use leftovers to make bread pudding)? There are plenty of recipes to choose from in my bread recipes section. 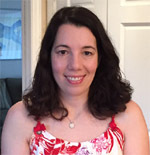 Can’t stop playing with your Instant Pot? Browse my whole collection of Instant Pot recipes and never run out of ideas! 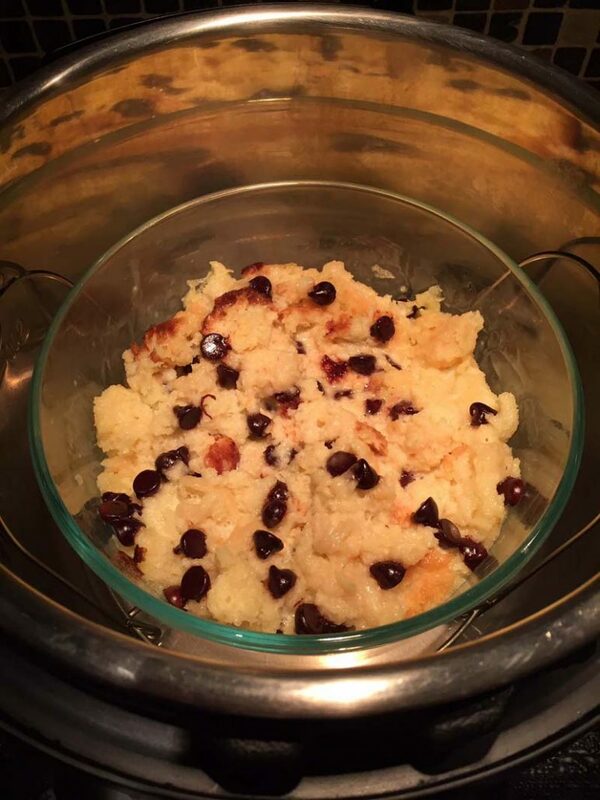 This Instant Pot bread pudding is amazing! Perfect texture, so creamy and sweet! This bread pudding is better than one in a restaurant! Instant Pot makes it so easy! Prepare a heatproof container that fits inside Instant Pot (I use Instant Pot Pyrex bowl). Spray it with a non-stick cooking spray. Put egg and sugar in a bowl and mix with a fork until combined. Add heavy cream and vanilla and mix until combined. Add the bread cubes and carefully mix until all bread is moistened (do not overmix). Add the chocolate chips and mix until evenly distributed. Transfer the bread pudding mixture into the container that fits inside Instant Pot. DO NOT cover the container with foil or any other cover. Pour 1 cup water in the Instant Pot and insert the trivet (the rack that came with the Instant Pot) with the handles up. Put the container with bread pudding on top of the trivet. Close the Instant Pot and turn the valve to a Sealing position. Press the "Pressure Cook" or "Manual" button and set the time to 10 minutes on High pressure. When it's done cooking, quick release (QR) the steam. Serve the bread pudding warm. If making bread pudding ahead, refrigerate until ready to eat, then warm it in a microwave before serving. I made this today and it was definately the best bread pudding I have ever had! It was so easy to make too and I love that it required only a few simple ingredients. Unfortunately I couldnt find any challah bread so I used brioche. Its v heavy on the calories esp using a whole cup of heavy cream but the taste is so good I still don’t think I would substitute it for anything else!